I totally blanked on last week’s post, sorry about that. The last few weeks have been good, busy and productive. I am making good headway on my Christmas knitting list. Three hats are done, five more hats are in various stages of progress, the current cowl project is going very fast (YAY!) and there’s a pair of footwear that only requires some ends to be woven in. More than half of my gift list is in some stage of completion so I think I’m doing good! We’ve traveled a bit this week. Two overnight trips in one week make for a tired family and strung-out pets, but we got to see just about everyone we’re related to. We went to visit GiGi (Jellybean’s Great Grandma) over the weekend. She’s 98, has a very hard time hearing, but other than that, is still going strong. She’s a wonderful lady and we all enjoyed our visit so much. Jellybean has been talking about GiGi just about every day since. We had Thanksgiving with my family and spent the night with my aunt before traveling home again. It was good to just hang out with my aunt and her family. This was the first Thanksgiving that my Grandmother wasn’t with us and I really missed her being there. We didn’t go anywhere this weekend, except for short walks down to the lake. Everyone in the house was glad for that. We have four cats in our house and two of them don’t really get along well. They’re both on Prozac (really.) to keep them calmer and they both missed their dose the nights we were gone. I walked in the house Friday afternoon and saw a bunch of fur in the kitchen floor then I saw a bunch of blood spattered on the floor. When I went to search out the cats to make sure they were ok, I couldn’t find Calvin. It seems that Buddy, the one who picks the fights with Calvin, lost this battle. He has a scarred nose and ear and had a claw sheath stuck in the back of his neck. *sigh*… cats. 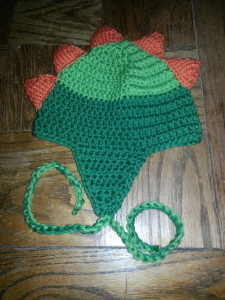 Anyway, in all the hustle and bustle, I did manage to whip up a really cute hat for Jellybean for this winter. This took me about two days. The body of the hat is crocheted, using the basic hat instructions from Repeat Crafter Me’s Crochet Owl Hat. 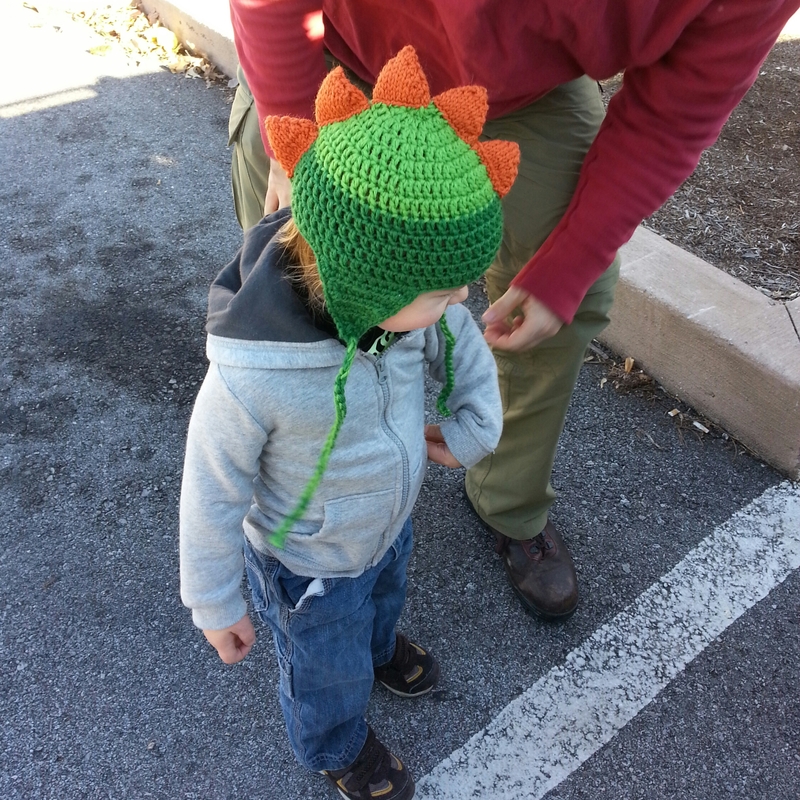 The spikes are from Kris Hansen’s Dino Cap. It was a lot of fun to make and Jellybean looks so cute in it. Of course I try to keep up with my very talented cousin, love that you have so much imagination and talent. Something I missed out on. Oh Lynn, thanks so much for commenting and reading my blog! Looks like I need to remind my bloggy friends about you. A lot of them enjoy hearing about Jellybean so I’m sure they would enjoy your blog. I’ll put you out there. BTW love the hat!!!! I think I’m going to have to make a few more and put them in the shop when I get the Christmas knitting finished. Abby, I think your blog is great. I am a friend of your mother’s and I am sure that even if she were the only one reading, it is a blessing to her. Wish my son would think of something like that. Of course, men are not good at communicating much (at least those in our family), but it would be so nice to know what was going on in his life so even if it ever turns out that only your mom reads your blog – don’t stop! I love your craftiness. Really cute hat. Nice that you can make your gifts – so much nicer than store-bought stuff! Hello Deanna, Thank you so much for leaving me a comment! Hi Lisa! I’m so glad you’re reading my blog. Let me know if you want to take crochet classes. I know of a couple of places near you.